At the Hammonds’ original sentencing, ... Más informaciones the judge noted that they are respected in the community and that imposing the mandatory minimum, 5-year prison sentence would “shock the conscience” and be “grossly disproportionate to the severity” of their conduct. As a result, the judge imposed significantly lesser sentences. The previous administration, however, filed an overzealous appeal that resulted in the Hammonds being sentenced to five years in prison. This was unjust. 76-year-old Dwight Hammond and his son, Steven Hammond, have won a pardon from President Trump. 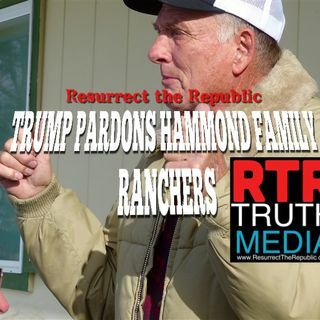 Trump signed the order granting clemency to 76-year-old Dwight Hammond and his son, Steven Hammond, 49, who were convicted of a federal law created to combat terrorism in 2012 for lighting a backfire to snuff another fire out that endangered their ranch which ended up burning what some consider to be “federal lands”, but which prosecutors had to admit actually benefitted the land in the long run. Though they served their original sentences for the conviction -- Dwight serving three months, Steven serving one year -- an appellate judge ruled in 2015 that the terms were too short under federal minimum sentencing laws and the Hammonds were resentenced to serve the mandatory minimum. This decision led to the 2016 protests. During the standoff at the refuge, FBI Agent W. Joseph Astarita allegedly shot rancher Robert "LaVoy" Finicum when officers arrested leaders of the occupation. Astarita was later accused of falsely denying he fired two shots at Finicum or his truck and pleaded not guilty to three counts of making a false statement and two counts of obstruction of justice. Libby was convicted in 2007 of perjury, obstruction of justice and making false statements stemming from an investigation into the leaking of the covert identity of CIA officer Valerie Plame. “I don’t know Mr. Libby,” Trump said in a statement. “But for years I have heard that he has been treated unfairly. Hopefully, this full pardon will help rectify a very sad portion of his life."